On Thursday 12th July the choir were invited to sing in a concert as part of Penryn’s big thank you to all those who gave their lives during World War 1. The concert was part of Penryn Week. Present was the Deputy Mayor of Penryn, Councillor Chaz Wenmoth who welcomed everyone and introduced the evening’s entertainment. Joining the choir at the concert were Helston Flora Quartet and Penryn Badgers. The choir were pleased to be able to premiere three new songs in their repertoire which included Dan Forrest’s arrangement of Charles Wesley’s great hymn ”And Can It Be”. Being present in the Methodist church was equally fitting when singing it for the first time. 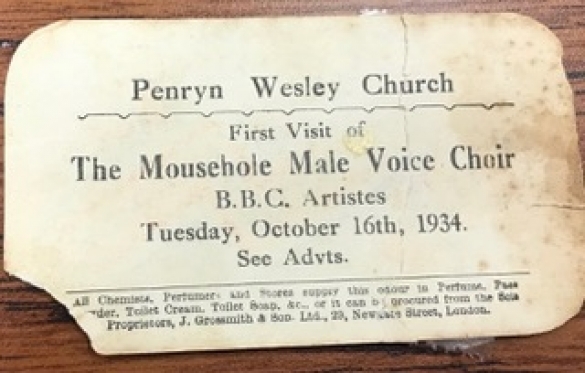 The choir were under the impression that this was the first time that the choir had ventured to Penryn, but Cornwall Council Chairman and councillor for Penryn, Mrs Mary May, told everyone present that this was the second time Mousehole MVC had sung there, the first time being in October 1934, when the choir had been described as BBC Artistes! Community hymn singing brought the evening to a close, with a vote thanks given by Mrs Shelley Peters the Mayor. After, everyone present then went to the Temperance Hall opposite for a drink………… of tea! !